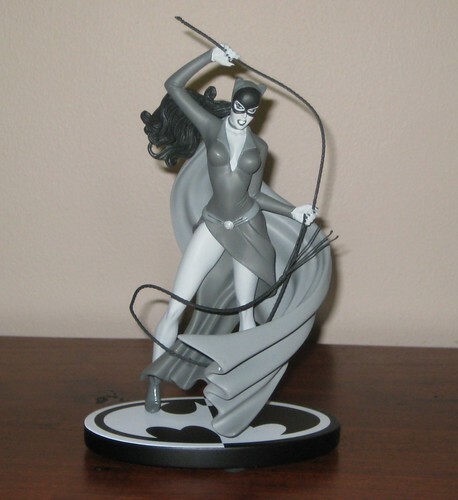 I am not a completist collector of DC Direct's Batman Black & White Statue line, but there have been the occasional pieces that have caught my eye, and two of these have been released relatively recently: the Steve Rude Catwoman and Frank Quietly Batman statues. The Steve Rude Catwoman statue captures my favourite Catwoman look. I doubt she'll be taken out of her leather gear anytime soon, and it's a look I've grown used to, but this cape and skirt combo is much more iconic Catwoman to me and it's great to see it captured here. Better yet, this is a fantastically dynamic pose - the raised arm, wide stance and flowing skirt and cape must have been a sculptor's delight, and it's been very well executed with a suitably fierce facial expression to match. I am quite fascinated by the incorporation of softer materials within a sculpt, and the whip here is nicely done. Firmly held in place and shape, but not easily breakable. It's a great accent for a near-perfect piece. 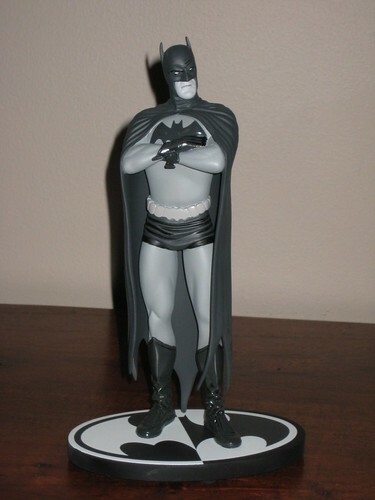 I'm aware that Frank Quietly's Batman design isn't everyone's cup of tea, but I am very fond of it, and this statue captures the look brilliantly. There are a number of things I like about Quietly's Batman: the wrinkles in the boots and briefs, the understated, straight-hanging cape, and the fact that his Bats isn't an overly muscled goon. One of the things that makes Batman who he is is the idea that he's a bit of an everyman who has become The Dark Knight - definitely superiorly fit and athletic, but not a massively steroided physique. The best part of this statue, however, is the headsculpt. It captures Quitley's Batman perfectly. Quite often I find that there is a degree of subtletly or detail that fails to translate from sketches to some of DCD's busts and statues (particularly their artist specific bust lines), but the Batman Black & White line seems to be fairly consistent in nailing these exactly, and this is a perfect example of that. These are statues I'm very happy to have amongst my Batman display. The smallish size of this line makes it an easy one to cherry pick as they don't have huge bases and can easily be placed on a smaller action figure shelf as well as a larger statue shelf. I'm waiting for a more classic version of the Joker to compliment these than the one that's already been released, and a Silver / Bronze Age Robin certainly wouldn't go astray as well! You can see more pics at Facebook, discuss this at the AFB Forum, and comment on this post to enter the October AFB Comment of the Month Contest - and remember it's my birthday this month so one AFB Facebook fan will also get a prize this month! My jealousy she knows no bounds! I'm not normally a statue kind of guy, but i'm really digging that catwoman for some reason. ROWR! Yeah, they are indeed two nice pieces! Nice one Andy! "...superiorly fit and athletic, but not a massively steroided physique." -I find this refreshing, too. Nice rendition of Batman. MMMMMM delicious black and white. That Batman is great looking. Who says you need dynamic poses? I like the vintage theme for both iconic figures.